At long last kerbside cardboard recycling is to return to South Shropshire. Hurrah! I am pleased that kerbside collection of cardboard for recycling is coming back to South Shropshire in December. This is long overdue. We have had to endure five years without kerbside collection. Cardboard is a vital resource and we should not be burning it in the Battlefield incinerator. When we resume household collection, we should also see a reduction in fly-tipping. We probably have more household cardboard waste than ever because we rely so much on online services delivered by the Royal Mail or couriers. The first carboard collection in South Shropshire will be on the first recycling collection day on or after 5 December. It’s all getting grumpy out there about Ludlow Skip Hire. At my request, the Environment Agency provided a statement yesterday about rats. In summary, the EA says rats are not coming from the waste site. Last Friday night, just as I popped into the Church Inn for a pint, I found a message on my voicemail. It was someone called Michael from Kidwells press group who do marketing, campaigning, blogging, tweeting “blah, blah, blah” . I’ve never heard of Kidwells press group. I didn’t call back. I don’t take sales calls. I simply don’t need any help blogging, tweeting or getting in the press. And anyone promoting communication who uses the word ‘blah’ doesn’t understand writing. There were four more calls but my mobile is usually set to silent as I spend much of my day and evening in committees or other events. I had one more voicemail but no information on what the caller’s concern was, just a first name and a mobile number. I have telephoned you many times over the last week or so and have not heard back from you; please would you respond to me? I would like to speak to you about comments you are making about our client, as above [Ludlow Skip Hire], and discuss with you what actions we might like to take and invite your assistance. This is a matter of some considerable urgency and I look forward to hearing from you at your earliest. So as soon as I got to a base where I could ring, I did so. The managing director of Kidwells, Michael Horne, demanded – it was not in my view a request – that I provide a statement that Ludlow Skip Hire is not the source of the reported outbreak of rats around lower Old Street, Jockey Field and Temeside. I was told that if I did not cooperate with this demand, Kidwells would issue a press release saying that I had refused to cooperate. I said that I thought his call was bullying. He disagreed and pressed for me to provide a statement to the satisfaction of his clients or, he repeated, the press release would say I had refused to cooperate. Kidwells are saying I must give a quote for a press release that they will edit and send to the media. I can’t do that. If the media ring, I respond. I send out my own press comment. But I will never contribute to a media release by a lawyer – or press agent – acting on behalf of their client whether I agree with the release or not. As it happens, I don’t disagree with his client. Let me clear about two things. Secondly, I have never said the waste is the source of the rats. I have asked for this to be investigated after residents’ raised concerns. That’s my job as a councillor. I sought a statement from the Environment Agency yesterday and published it. The EA says this site is not the source of the rats. I have been threatened by Kidwells today. My job is to listen to residents and when they raise concerns, try to find solutions. That involves me speaking out. It’s not rocket science being a councillor but it’s certainly easier without a lawyer or press agent, or whatever Kidwells is, trying to get me to speak on behalf of his clients, not my constituents. The Environment Agency have confirmed that the site was operating in accordance with its permit on their last visit on 25 September. I’ve had a number of enquiries about whether anything can be done about the junk mail that comes through most of out letterboxes. The answer is yes! Just fill out the form below and post it off to the Royal Mail address given. In my experience, this service works except when my usual postie is on holiday. I said the Royal Mail should issue reminders but they have not responded to that suggestion. The House of Commons Library has produced a useful note on how to stop junk mail, emails (spam) and telephone cold-calling. The Environment Agency has given a waste company extra time to clear a waste pile in Ludlow but warns of smells over the next couple of weeks. 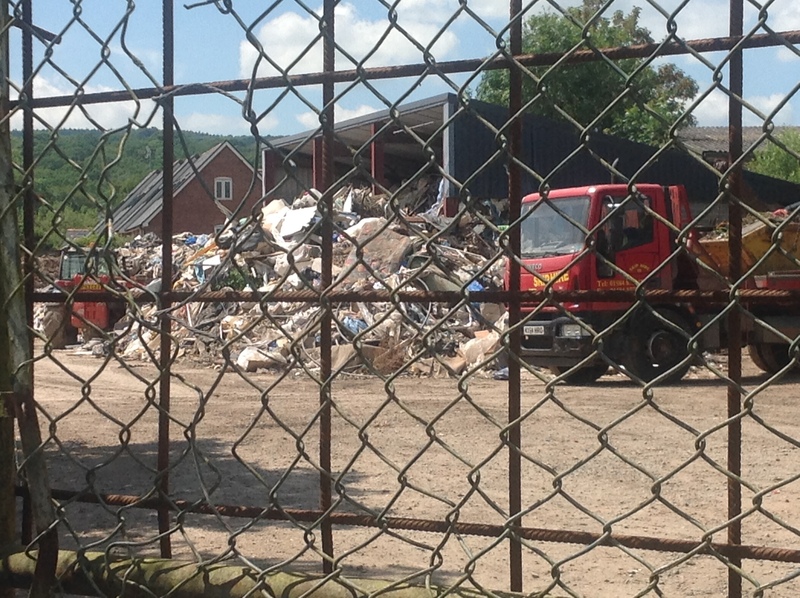 Ludlow Skip Hire inherited a huge pile of waste when it purchased the site earlier in the year. As the weather got hotter up, the rubbish pile began to stink. People were also getting worried about the fire risk. Councillor Vivienne Parry and myself asked Shropshire Council to contact the Environment Agency to get the problem dealt with. The agency gave the skip hire company five weeks to clear several hundred tonnes of waste on the site, which is only licenced for storing 66 tonnes of waste. The company hasn’t quite made the deadline. It has moved around 500 tonnes of waste wood, soil, and mixed waste. But there is a lot of mixed waste, including domestic waste, remaining. The Environment Agency has now given the company a two week extension to get the waste down to permitted levels. The problem is that some of this waste has been around for a long time and it stinks. I am sorry for the residents of Temeside and of St Laurence’s View in particular who have had to put up with this smell for months. I am grateful that Ludlow Skip Hire has worked hard to get this problem resolved, though I am puzzled why the problem arose in the first place. I hope it will be able to get the rest of the waste cleared in the next couple of weeks. Between 12 May and 20 June there has been a significant decrease in material on site. Ludlow Skip Hire has removed just under 300 tonnes of sorted mixed wastes from site and approximately 195 tonnes of soil and stone. They have diverted around 40 tonnes of waste directly to landfill rather than sorting it on the site. The company has had to turn business away. Despite this it has managed to retain its six employees. I’ve been contacted by the Environment Agency. Ludlow Skip Hire have cleared 800 tonnes of excess waste. There are 100 tonnes left to be removed to bring the site down to its permitted storage levels. The company is working to get the rest of excess taken to landfill. It is refusing any skips which have more than 25% mixed waste. Normally these would be sorted on the site to reclaim materials before the residual material is sent to landfill. Now whole loads are sent directly to landfill. That’s not good environmentally or for the balance sheet of the company. 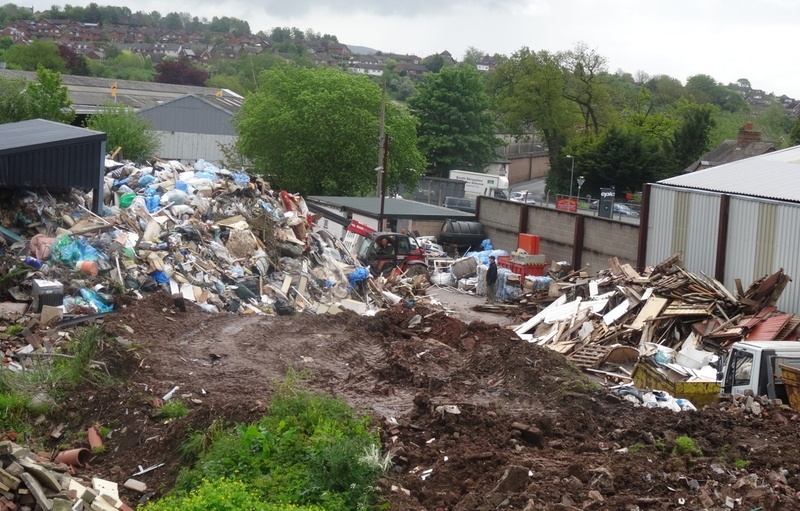 The Environment Agency has now agreed that Ludlow Skip Hire can have until the end of July to clear its waste.This follows detailed discussions with the company about its operations and finances. I agree with this. The waste remains an inconvenience to residents and at times it stinks, but it is being cleared in a controlled manner and in a way that will allow the company to continue in business. The Environment Agency have clarified the timescale for removal of waste. A huge pile of rubbish in the centre of Ludlow is to be cleared after councillors asked the Environment Agency to take action. Ludlow Skip Hire Ltd recently took over the waste transfer site on Temeside. The site is only licenced for storing 66 tonnes of waste but it has many times that volume at present. Neighbours have complained about the unsightly mess and smell, and they are worried the pile will attract rats. After Viv Parry and I contacted Shropshire Council officers, the Environment Agency was called in. Alison Pearson, Shropshire & Herefordshire Environment Officer for the EA inspected the site last Friday, 9 May. She found that the site is “not in compliance with its environmental permit.” The site operators assured her that the waste pile is a temporary problem. Alison agreed with the operators that she will receive a weekly update on reduction in the waste pile. If the stockpile is not substantially reduced by 20 June, the EA will serve a notice to suspend the operator’s permit, which will stop more waste entering the site. The first thing we needed to sort out is the licence conditions for the site. It’s a transfer site for sorting waste, not a storage site. As such, it is licenced for just 66 tonnes of waste. It’s storing a lot more than that at the moment. The debris is piled far too high and more waste arrives by the day. The agreement we now have is a good one. Ludlow Skip Hire has a month to clear the rubbish. They say they have already reduced the stockpile by 110 tonnes. The deadline set by the Environment Agency should ensure that the site operates within its licence conditions in the future. It will also reduce the risks of vermin and smells over the summer months. Shropshire Council and the Environment Agency have acted quickly and effectively.